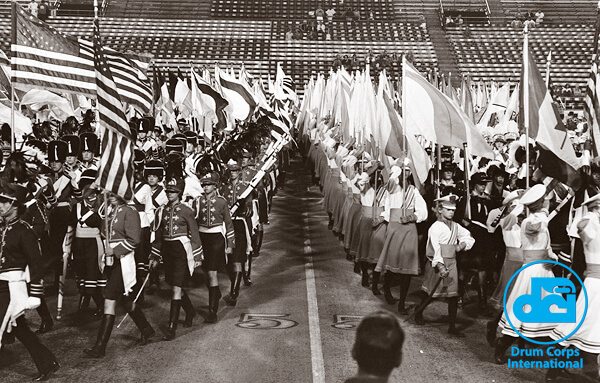 Perhaps an odd sight to today's drum corps who perform primarily in high school and college stadiums across the United States, corps members march down the 55-yard line at Ivor Wynne Stadium during the finale of the DCI Canada Finals on July 7, 1979. Compared to the American football field length of 100 yards, Canadian football fields measure 110 yards, allowing for the 55-yard line marker down the center of the field. Canadian fields also add 10 extra yards to the length of each end zone and are 65 yards wide compared to an American field at just over 53. Taking place in Hamilton, Ontario, DCI Canada—a regional competition that existed through 1990—was a single-day two-part Prelims and Finals competition in 1979. The event featured a lineup of 19 corps from both Canada and the United States. Phantom Regiment led the field of 12 finalists at the evening competition, taking first place over the Bridgemen by more than 6 points. The four corps pictured on either side of the 55-yard line from left to right: Holy Family Defenders (Rockland, Mass. ), Greece Cadets (Rochester, N.Y.), Offensive Lions (Jonquiere, Que.) and Troopers (Casper, Wyo.). Demolition of Ivor Wynne Stadium began in December of 2012 to make way for a new facility that will continue to house the Canadian Football League's Hamilton Tiger-Cats. Photo from the Drum Corps World archives. Scanning and archival services provided by Drum Corps International corporate partner WeScanFiles.com.